One of the more violent and stylish entries in the Italian slasher cycle of the early '80s, A Blade in the Dark attempts to outdo Dario Argento's Tenebrae with a similar stalk and slash mode that eventually escalates into a bloodbath that wipes out most of the cast. Son of legendary director Mario, Lamberto Bava's experience behind the camera as assistant director for both his father and for Argento shines through here; amazingly, Blade was only his second film following his promising debut, Macabre (Frozen Terror), and here he cultivates his skills for dealing with irrational fantasy and gore which erupted full force in the later Demons films. Young composer Bruno (Occhipinti) is hired by his director friend Sandra (Papa) to score her latest horror film. To get him into the mood, she sends him to stay at a rented villa which whose spooky atmosphere will hopefully inspire him to write a truly terrifying score. They both get more than they bargained for, however, when a killer starts stalking the grounds. On his first night, Bruno is startled by a ditsy young woman named Katia (shades of Black Sunday!) hiding in the cupboard; the girl dashes off and is quickly slashed to death by an assailant wielding a utility knife. Soon after, another girl who drops by to use the pool winds up disappearing as well. As the suspects begin to add up, even including Bruno's actress girlfriend, Julia (Naszinsky), he begins to put together the pieces of the puzzle and comes to realize that there's more than a passing connection between the film he's scoring and the rising body count in real life. 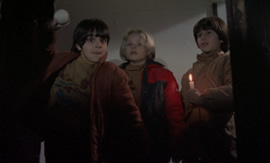 The true running time for A Blade in the Dark (original title: La casa con la scala nel buio, or House of the Dark Stairway) has long been a matter of dispute among Italian horror followers. 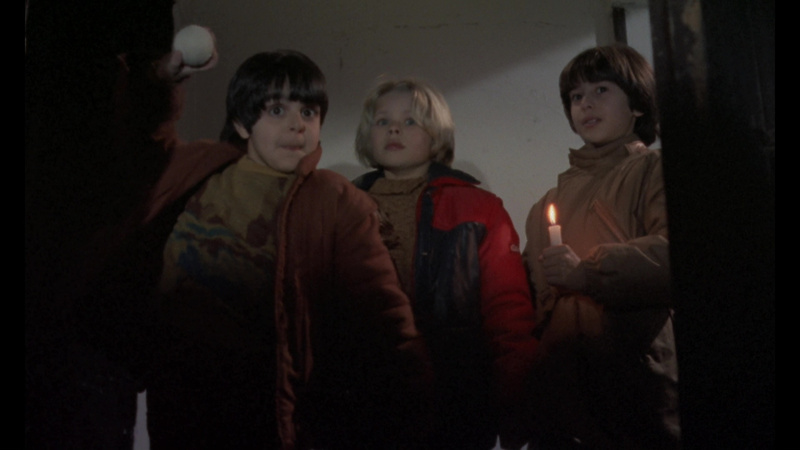 The film was originally shot for Italian television (hard to believe considering the extreme gore on display) and planned as four 27-minute installments. However, the final cut of the film slated for theatrical release, at least in its English language form, wound up at 96 minutes. Essentially the print seen on laserdisc from EC Entertainment and earlier on VHS by Lightning Video in the '80s was uncut in terms of being a final "director's cut" for international distribution; however, a somewhat longer version existed only in Italian for years and floated through some bootleg tape dealers. The first English-language longer version turned up on DVD from Anchor Bay in the early '00s, claiming 104 minutes on the packing but running 108m36s. The extra footage doesn't add much in the way of plot development or gore, but it does achieve a more layered, character-motived approach than the consumer friendly earlier cut. Some of the restored scenes include Bruno making a pay booth call to Julia's boss, more atmospheric night scenes of Bruno exploring the house, a longer build up to the second murder, and several extra red herring bits involving Stanko Molnar as the groundsman, fondling scissors and generally acting suspiciously. On the other hand, this material slows down the pace a bit, so owners of the old VHS version might want to still hang on to it. Despite the 16mm origins, Blade looked surprisingly good on DVD for the time, some inherent graininess in the original negative notwithstanding. The film itself has held up fairly well, thanks mainly to the shocking murder scenes (though the last killing is awfully gratuitous) and an appealing lead performance by Occhipinti, who also appeared in Lucio Fulci's New York Ripper and Conquest before achieving infamy as the bullfighter who slurps honey off of Bo Derek's navel in Bolero. Future horror director Michele Soavi makes a very amusing appearance here and even served as first unit director (hopefully out of costume at the time). The rest of the cast is somewhat less impressive, though this may be due to the ridiculous dubbing ("I love composers; so tell me, how are you in the feathers?" and "Is it possible you're a vacant nerd?" are two of the most oft-quoted offenders). 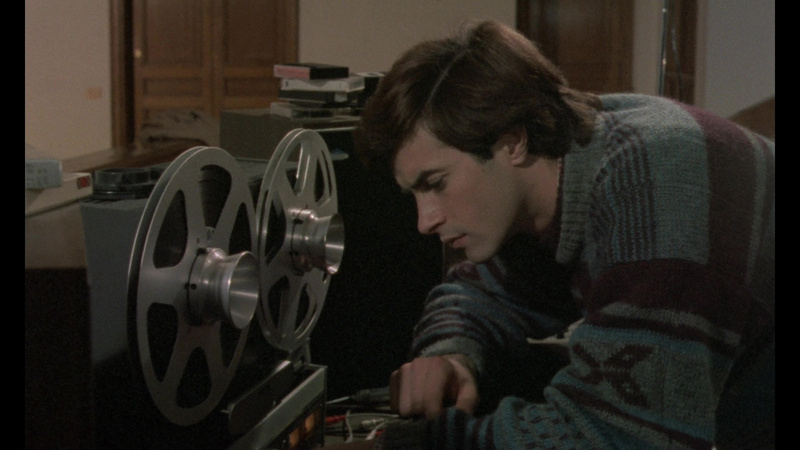 As always, the De Angelis brothers deliver a top notch score, basically a repetitious electronic tune a la Halloween that weaves in and out of Bruno's keyboard performances and the murders themselves. Extras include a 20 minute "Behind the Blade" interview with Lamberto Bava and writer Dardano Sacchetti, in which they discuss the genesis of the film and the low budget shooting process, some appreciative liner notes by Tim Lucas, and the gory European theatrical trailer. The same disc was later reissued with an identical transfer and extras from Blue Underground. 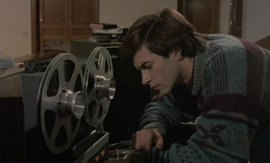 Extras on this edition include the Italian-language opening and closing credits, a 19-minute interview with cinematographer Gianlorenzo Battaglia (who also served under Mario for many years and talks about his Lamberto collaborations in some depth including shooting this film on the property of producer Luciano Martino in a scant 18 days), and a 50-minute screening Q&A with Bava moderated by an uncredited Calum Waddell staring with his early assistant directing days (including Bay of Blood) through his more famous directorial efforts. The camcorder lensing and Bava's thick accent are a little challenging, but there's some good material here reminiscing about Italian horror's golden age. Updated review on August 31, 2015.